Do you remember the article “How to analyze traffic with SPAN feature“? The SPAN port is a feature that mirror traffic (on physical or virtual port) to a specific port. In general, behind this ‘destination’ port can be a traffic analyzer (wireshark, ntop and so on…), an IDS or other appliances. The number of SPAN sessions that can be configured is limited. A destination port receives copies of sent and received traffic for all monitored source ports. If a destination port is oversubscribed, it can become congested. This congestion can affect traffic forwarding on one or more of the source ports. Granular Traffic Analysis: VACLs can match based on source IP address, destination IP address, Layer 4 protocol type, source and destination Layer 4 ports, and other information. This capability makes VACLs very useful for granular traffic identification and filtering. Number of Sessions: VACLs are enforced in hardware; the number of Access Control Entries (ACE) that can be created depends upon the TCAM available in the switches. Destination Port Oversubscription: Granular traffic identification reduces the number of frames to be forwarded to the destination port and thereby minimizes the probability of their oversubscription. Below an example to understand how to configure the switchport capture feature. Suppose that you want classify the http and https traffic between clients on vlan100 / vlan200 and ServerA / ServerB on vlan10. 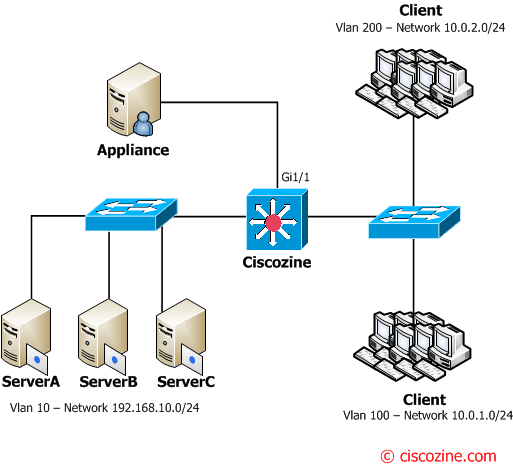 show vlan access-map: Displays the contents of the VLAN Access Maps. show vlan filter: Displays information about the VLAN Filters. VACLs have an implicit deny at the end of the map; a packet is denied if it does not match any ACL entry, and at least one ACL is configured for the packet type. If an empty or undefined ACL is specified in a VACL, any packets will match the ACL, and the associated action is taken. To find out if your switch supports this feature take a look at the Cisco Catalyst Switch Guide. The VACL Capture Port feature can help to overcome some of these limitations. VACLs are primarily not designed to monitor traffic, but, with a wide range of capability to classify the traffic, the Capture Port feature was introduced so that network traffic analysis can become much simpler.